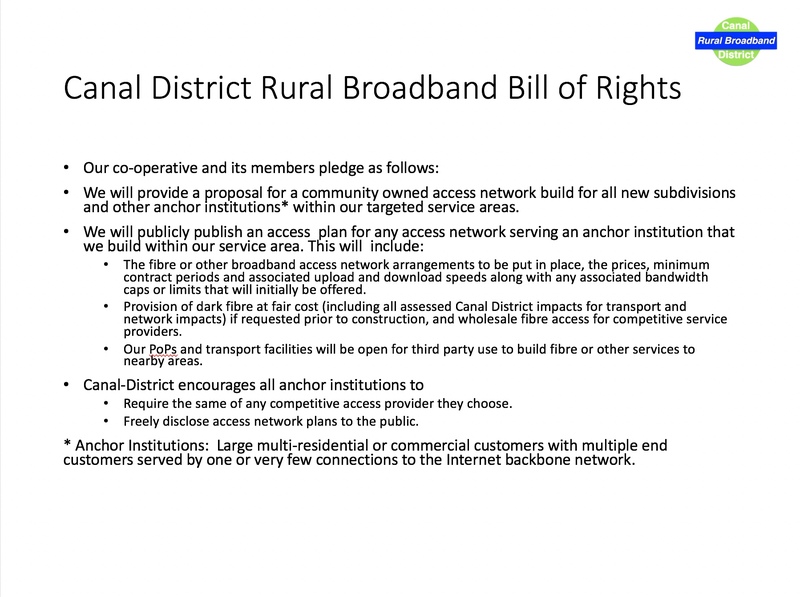 A summary of our recommendations to our community based on HMCD’s advocacy work on rural broadband. We will provide a proposal for a community owned access network build for all new subdivisions and other anchor institutions* within our targeted service areas. The fibre or other broadband access network arrangements to be put in place, the prices, minimum contract periods and associated upload and download speeds along with any associated bandwidth caps or limits that will initially be offered. Provision of dark fibre at fair cost (including all assessed Canal District impacts for transport and network impacts) if requested prior to construction, and wholesale fibre access for competitive service providers. Our PoPs and transport facilities will be open for third party use to build fibre or other services to nearby areas. Require the same of any competitive access provider they choose. Freely disclose access network plans to the public. * Anchor Institutions: Large multi-residential or commercial customers with multiple end customers served by one or very few connections to the Internet backbone network.